Firstly, the team will work closely with you to choose from one of our Easy Living Designs that suits your budget and requirements. Once you’re happy with the selected design, we move forward to your Free Fixed Price Tender. If you have chosen to proceed with a Custom Design, you move straight to point B. At this stage, you secure the tender price and any associated promotions at the time of purchase by paying a non-refundable initial deposit of $2,500. Mincove Homes then arrange the reports required to establish your home, including contour surveys, soil reports and wind ratings, as well as beginning the working drawings. If you have chosen a custom design project, preliminary drawings will be presented to you at this stage. Once you are happy with your preliminary drawings, a draft HIA Building Agreement will be provided to you for review. Mincove Pro Tip: Before this step, ensure you have sought financial advice from your bank or lending institution as to your borrowing capacity. This will ensure you are not subject to what can be lengthy delays in the beginning stages of building your new Mincove Home. The building agreement and working drawings are finalised and are presented to you to sign. A non-refundable deposit of 5% of the contract price (minus the initial deposit of $2,500) is also required at this meeting. Contract terms and conditions cannot be altered past this point. Mincove Pro Tip: Ensure you have reached the stage of formal finance approval with your lending institution and are able to present this in writing. We dedicate a day for your Selections Meeting with our award-winning Colour Selections Consultant. 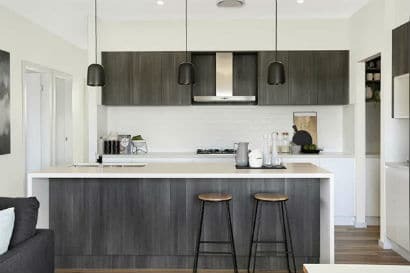 The day commences at Mincove Homes Head Office in Albion Park Rail and you will be able to select your colours and inclusions*. You will also be given the opportunity to request any upgrades outside of our standard inclusions and your specifications at this meeting. Following this meeting you will visit our Tile & Kitchen Suppliers on the same day, finalising all selections. Mincove Pro Tip: Prepare for your colour and inclusion selections by collating example images of the look and feel you’re aiming for and bringing them along to the meeting. This will ensure our Selections Consultant has a clear vision of your dream home and can work closely with you to ensure your new Mincove Home exceeds your expectations.